Danish singer/songwriter Agnes Obel released her second album "Aventine" in September 2013 via Belgian label Play It Again Sam. Belgian blogger/procrastinator Spook releases his first review after more than two years near total silence, except a post here and there. The link between both is Belgium, but it doesn't matter. Agnes Obel's first album "Philharmonics", also issued by Play It Again Sam, was issued in 2010 and it showed a pretty talented new face on the European scene, if there is anything close to a European scene. This debut album gained a wide popular recognition mostly thanks to its excellent, stylish but also catchy single "Riverside". I liked the song, but I was a little underwhelmed by her cover of John Cale's "Close Watch", and my interest for the lady stopped there. It was obviously a mistake. "Philharmonics" contains its share of some of the most exquisite chamber pop pearls I've heard in a long time, because pop music it is, despite the instrumentation, violin, cello and piano for the main part, the spare arrangements and the obvious influences of French composers like Erik Satie and Claude Debussy, for instance. 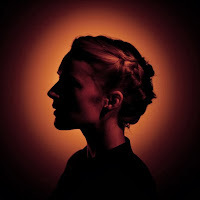 Agnes Obel is writing melodic songs with hooks and memorable refrains, the song "Riverside" being a perfect example. One of the main artistic successes of "Philharmonics" lies in the brilliant balance between both music worlds. Now my main reserve concerning this album remains after dozens of listens its near dry, if not stern (just like Obel's face on the album cover), certainly polite sound production. Agnes Obel frigid, though adequate, vocal deliveries, still leaves me sometimes on the fence, uninvolved, and rather cold. Something especially felt on the above mentioned "Close Watch". "Aventine" is a close but relatively different affair. Agnes Obel's sophomore album begins, just like her debut, with a lovely piano instrumental, "Chord Left", but from the first kick of the little hammer on its string, one can discover a slight if welcoming shift in the sound, it is as if instead of posting the microphones at some academic distance from the instrument, they were just planted in the belly of the beast, and it makes for a more organic, warmer and at the same time darker impression. Consequently the French composers references become less relevant as the general atmosphere of the track, and everyone that follow, drift away from the first album classical and polite sounding towards something more sepulchral, almost Gothic in mood. The second song, "Fuel to Fire", is clearly one of the best in Agnes Obel's catalogue, and surely a highlight of "Aventine". It starts with a hypnotic piano line soon punctuated by closed-miked finger-picked cello, then Agnes' voice enters and it is immediate teleportation to another world, a dark and wide landscape, a Nordic forest at dawn maybe, with huge snowy mountains standing at the horizon, still blockading the near polar sun. There is more of a Canadian's or Norwegian's panorama in this sound than Danemark, it seems, but it can be just a feeling, I've never visited this honorable country. Nevertheless, my humble references to both countries could be consistent with the very presence of Canadian folk project band Timber Timbre's violist Mika Posen, but also with string arrangements not that far away from Sweden-based Norwegian singer Ane Brun's jewel of an album "Changing of The Seasons". Furthermore, the piano sound recording makes me strongly think of Norwegian Deaf Center's, if less extreme, on their masterpiece "Owl Splinters", to the point that I suspect Agnes Obel to have listened to that record extensively, or just enough to find some inspiration for the piano sound of her next album. The Norwegian references don't stop here, in my perception at least. The way Agnes Obel sings on the eponymous song, surely during the refrain, is especially reminiscent of Phaedra's phrasing on her seminal debut "The Sea", on "Honeydewed Autumn", for instance. I don't try to find Agnes Obel guilty of anything, except maybe for finding, at least looking for, inspirations into less obvious territories (PJ Harvey's "White Chalk" in 2007 comes to mind concerning her debut), and closer to home at the same time. I don't know if those were her inspirations, it actually doesn't matter, what matters is that, in my book, with "Aventine", Agnes Obel is getting pretty close in musical quality to those excellent musicians, songwriters and composers. Besides, even if Agnes Obel is certainly more of an introvert singer, she succeeds to introduce more palpable emotions through her very fine voice, surely on the second half of the album, with the very fine single "The Curse", with another hypnotic piano line - her trademark, almost - and a deep low cello accompaniment, which I haven't heard to that extend since Nina Nastasia's "Run to Ruin" in 2003, and mostly on the other favorite of mine, the rather spare, just piano and haunting backing vocals, "Words Are Dead" : when Agnes repeats "Don't cry for me, oh don't cry for me", my heart sobs. Now "Aventine", despite its obvious striving for perfection, and maybe because of it, has its downsides, at least two. The already mentioned eponymous song leaves me somewhat unsatisfied, despite its infectious melody, the string arrangements are thick, the string pizzicato mechanical and it sounds like a waltz to be danced by a gang of Trolls. Also, overall, this second album is still a little too well dressed, too perfectly ironed and buttoned up, it still lacks some adventure, inventiveness and maybe just soul. All in all however, "Aventine" stands above the majority of the musical production, and it is not the least of an achievement considering Agnes Obel wrote, sang, produced, arranged and mixed the whole thing by herself. Very recommended autumnal album... but you may listen to it in Spring, you know.